I play many instruments like Piano, Guitar, Bass, Drums, Mandolin, Violin, Banjo, and my keyboard can cover the Wind instruments if needed. And I love Tactics and I see a lot of the things that are getting done here IDK if any one is working on any games but I'd like a crack at a play test and perhaps helping putting some tunes down on the storyline parts if needed. I can get the feel of what I would play musically to complement the story writing. Also I'm more in so looking for people writing there own story and not just modding the old one Thank You! We only have 2 actual story mods on the site right now, which are Kokojo's Call of Power, and my Journey of the 5. Take a look and see if you'd wanna help out either one. Also, can you post a sample of some music you've made? 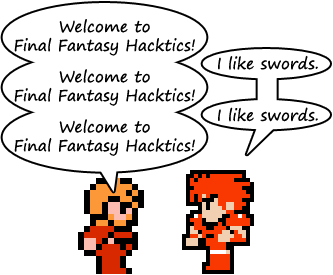 We do have the possibility to edit the music in the game, which would need to be converted from music sheet/midi back into FFT's format. It would certainly be awesome to have a composer on FFH. I'm watching the JoT5 play through now and I have turned off the sound cause the commentary was too much. Also a lot of the scenes seemed rushed so I have been pausing to read which I like everything so far and I'm about a 1hr and a half into the video of the chapter 1 play through from Chimp. As for the Music I'd need to get some of my recording equipment out I will work on this though and post some samples here ASAP. I may need to watch the play through a lot though to get a nice feel on what I hear for cut scenes. As for the music I've already made I most of which have words others are just simple instrumentals That I have that are not recorded at the moment some of which might fit a cut scene or two as well. We'll see but this seems like it would be fun and I look forward to doing it. Although I know nothing of how to program I always wanted to contribute to something like this. Edit: Also is there anywhere I can look at a video of the other story mod as well?